The project marked the first collaboration between the established motorcycle engineering group and engineers from the ascendant automobile division. The internal rivalries were real, fierce and drove considerable human energy into an already urgent project. The auto engineers were given the principal task of masterminding engine development while the “bike” team handled everything else. In a crucial stroke of organizational genius – the “auto” team was given essentially free reign to design the new engine without interference. They responded to the challenge with a stunningly bold solution. The “clean sheet” engine design was clearly automotive in character and robustness, yet had innovative packaging to support serious sporting flair for motorcycle duty. Time and market success proved that the GL1000 was well-suited to the task of capturing the attention of the crucial North American market. 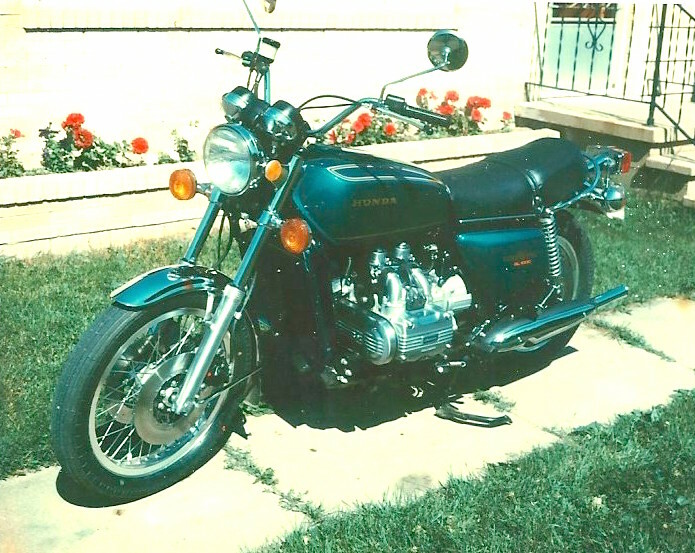 Artistically, the GL1000 was eventually recognized by the highly regarded Guggenheim Museum Exhibit (“Art of the Motorcycle”) as one of the top designs ever. History has also proved that the GL1000 is one of the best engineered motorcycles ever. Every aspect was well-designed for it’s day, but the engine is clearly the most successful part of an overall superior package. To this day, modern current GoldWings continue to share extensive DNA with the original GL1000 engine design. How good is the GL1000? Judge for yourself, but here’s some evidence to consider. 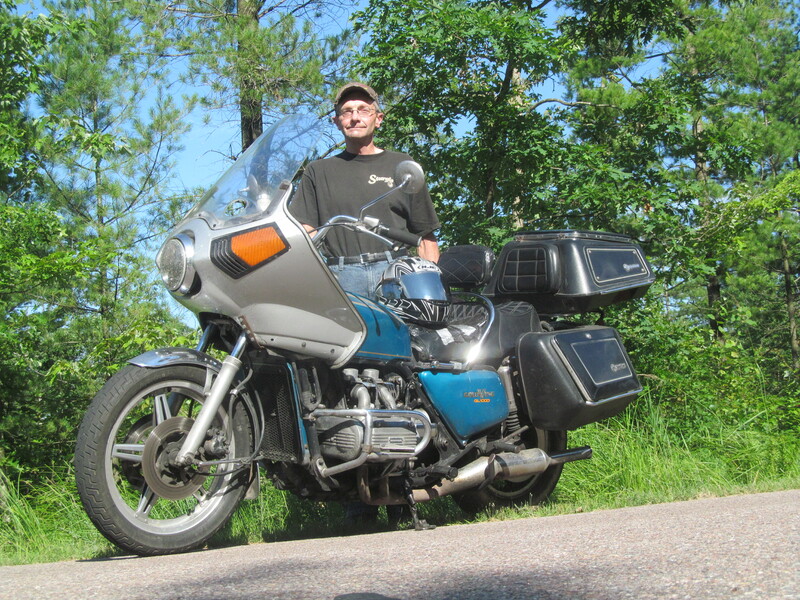 Allan Zahrt of Wassau, Wisconsin purchased his 1975 GL1000 brand new as a “left-over” model in 1976. On July 29th, 2017 Allan’s odometer rolled over to ONE Million miles! You read that right: ONE Million miles! Allan’s accomplishment is quite amazing. 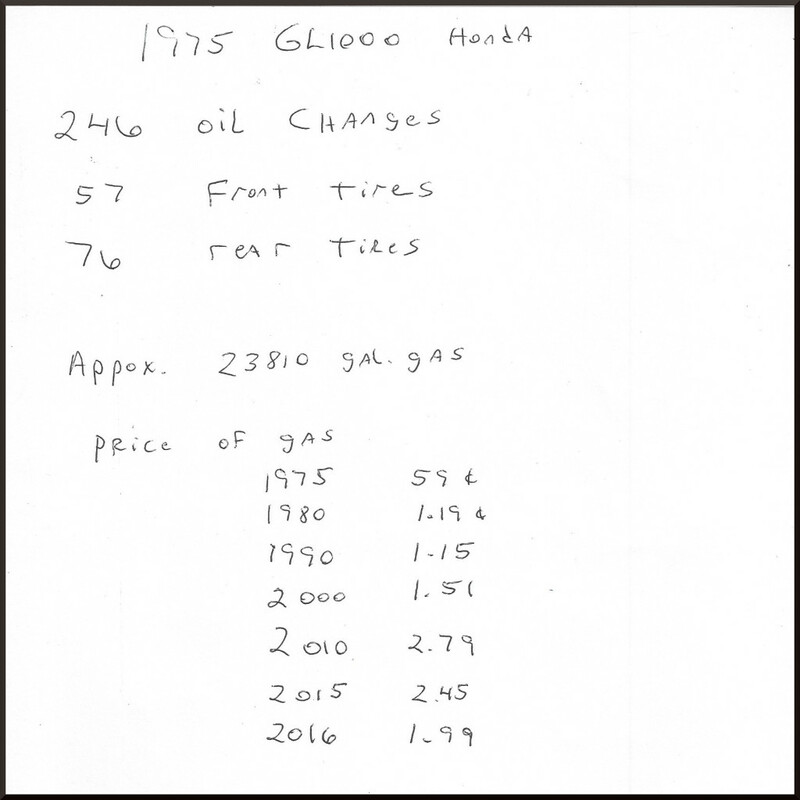 He holds the record for the most mileage accumulated on a GL1000. 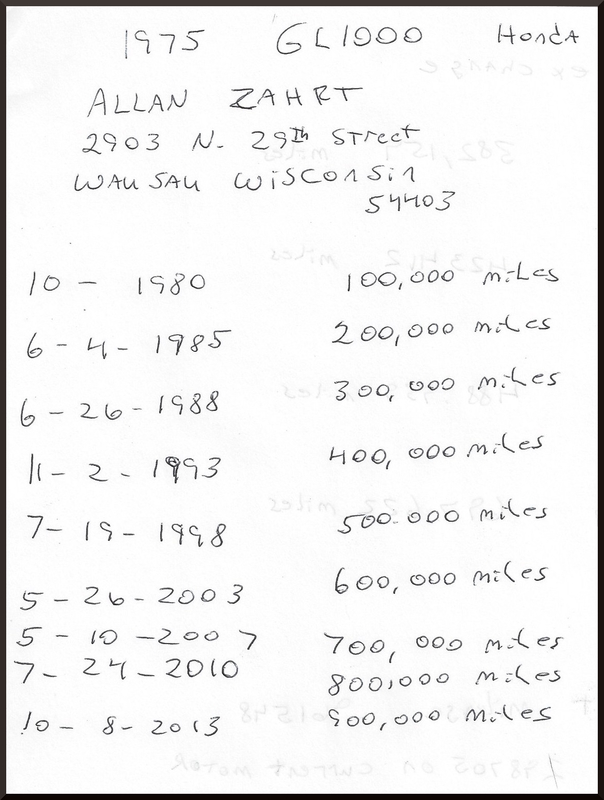 Actually, there is only one other rider who has accumulated a documented one million miles on a single motorcycle: State Senator Dave Zien (also from Wisconsin) achieved this milestone on his 1991 Harley-Davidson Sport Glide in 2009. That bike is now in the Motorcycle Hall of Fame in Sturgis, South Dakota. 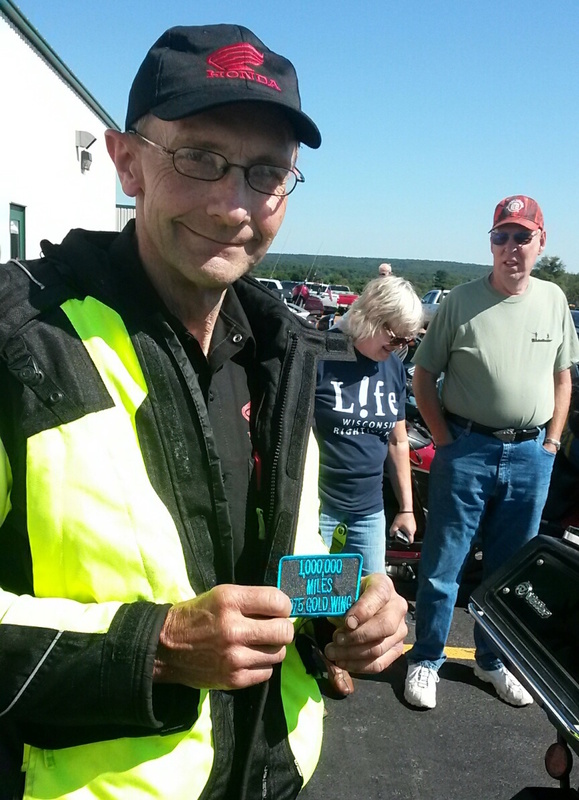 The Harley-Davidson Motor Company honored him by presenting him with a brand-new 2009 Road Glide. 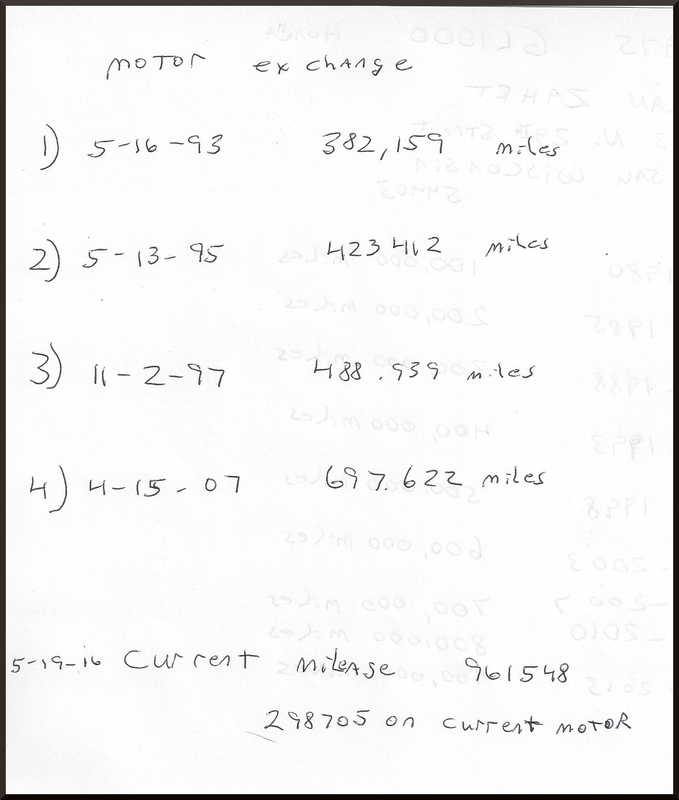 “I have put together numbers taken from my personal maintenance log (excerpts below) and I will briefly cover some of the questions. I am on my 4th motor. 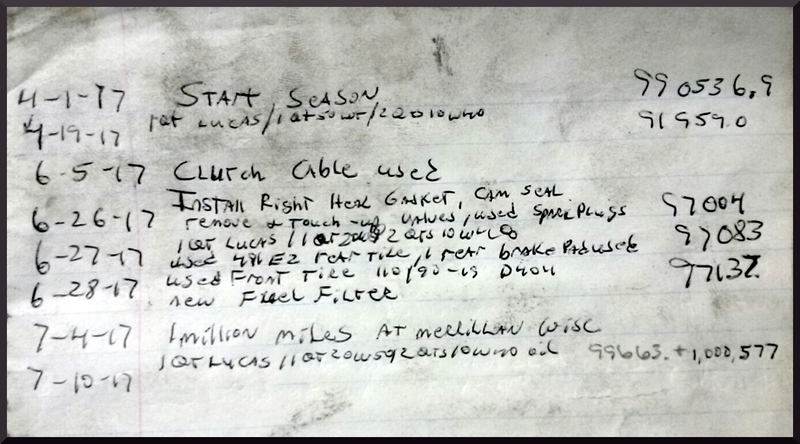 The original motor went to 382,000 miles. I did overhaul it once (main bearings, rod bearings and rings pistons were stock). 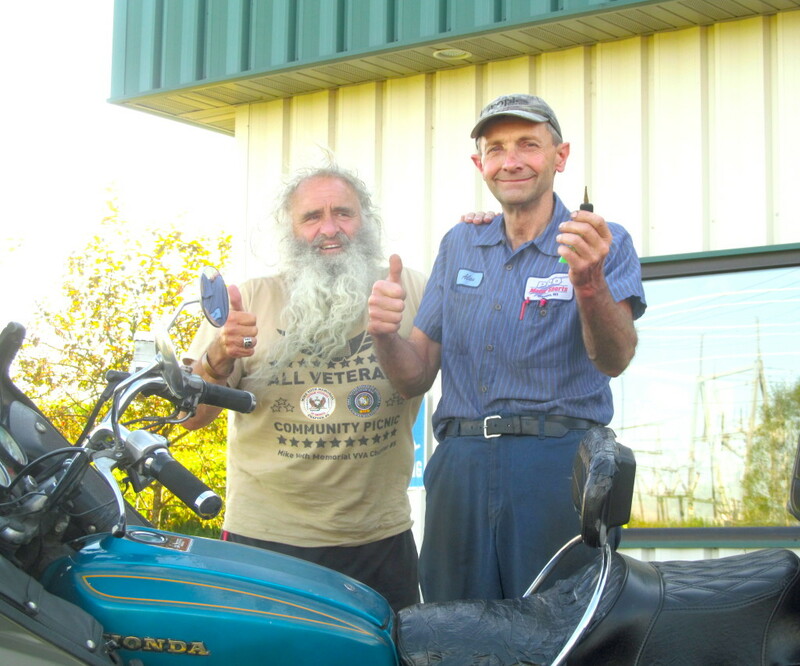 It is easier now to purchase a motorcycle for parts and donor motor. Once the motors accumulate high miles (300,000 plus), they become quite loud. Not a knocking or ticking noises, just loud. I were ear plugs when they are at that point. The last motor I put in (which is now at 300,000 plus miles) ran poorly. It ended up being a bent connecting rod on number 4 cylinder. Valves are the weak link at high miles. Tattle tale signs of valves issues are reduced fuel economy, hard starting and power loss. I change my oil every 2500 to 3000 miles. I use standard motorcycle oil. For most of its life, I have used Spectro brand oils. I use regular gas. The gas we use today is not the same as gas not that many years ago. I adjust for the ever changing fuel we use. Ethanol fuel hasn’t been a problem for me. My motorcycle is used on a daily basis. I have only had to walk away from the Goldwing twice. A flat tire I couldn’t repair and a stripped drive shaft-to-final drive spline coupling. The rest of time it always got me home from every outing. When you are on the road I alway carry 4 things: duct tape, electrical tape, zip ties, coat hanger and some basic hand tools: visegrips, cresent wrench, hammer, etc. Crashes: only two thankfully. (a crash in Al’s book is determined by both hand coming off the handle bars) I was able to drive home from both of them. 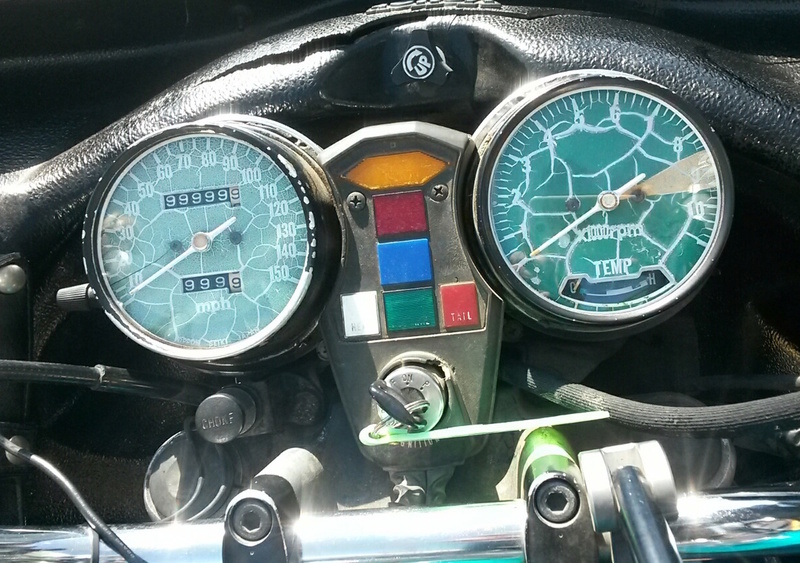 As you can see by the pictures some parts of my bike are taken from other model year Goldwings. The original spoke wheels are fine, but require more maintenance – so I have installed newer Comstar solid spoke wheels. The original style exhaust system tends to rust out much more frequently than the later model ones that I am using now. The Vetter accessories have been on the bike for most of its life. They have been replaced as the plastic has cracked and the mounts wear out. You can only patch them with hotcha cement for so long. 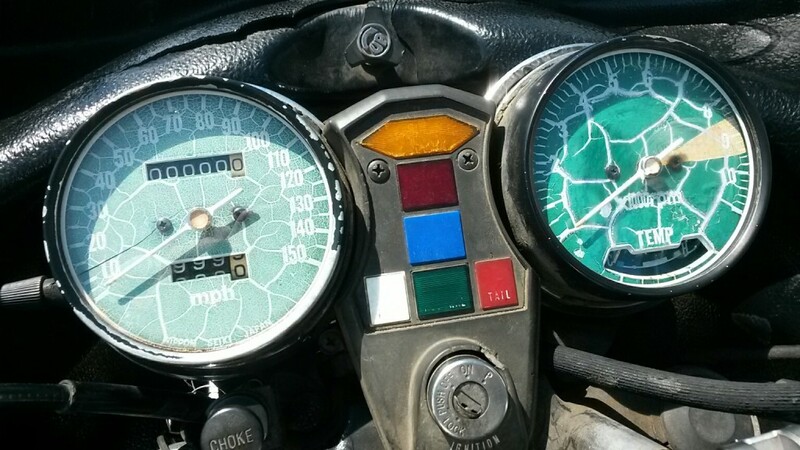 The frame, handle bars, gauges (I have rebuild the gauges with donor parts from other bikes, mostly the little plastic gears wear out, but the face plates are stock) gas tank all stock. Fork tubes eventually the chrome wears off and have to be replaced. I still use the key (there are no tumblers in the switch anymore). I consider it good luck! 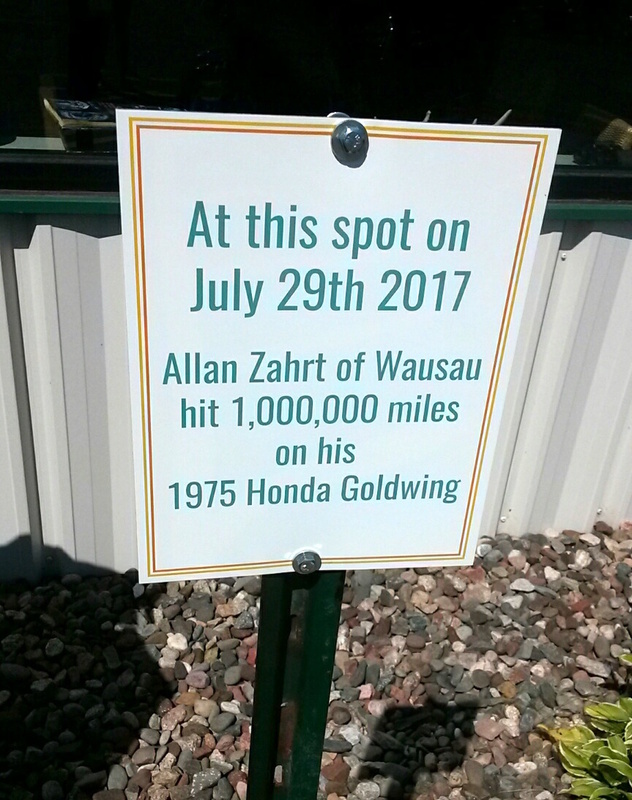 Honda of America – what are you going to do to honor Allan Zahrt’s accomplishment on his Honda GL1000? Few machines are engineered well enough to provide reliable service for one million miles. Congrats to Allan on this remarkable achievement! 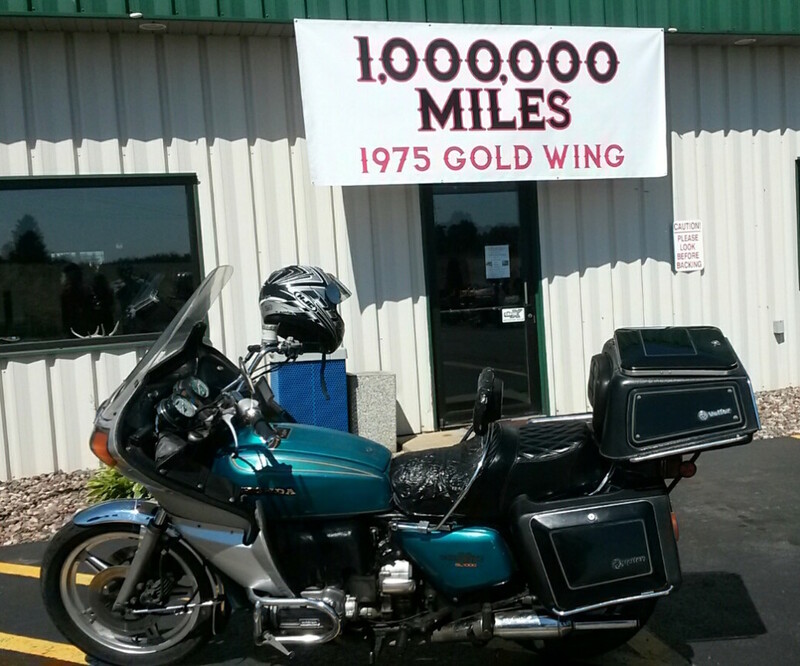 I have a ’75 gl1000 Goldwing. How can you tell by the vin what number of production my bike is?